Well, it’s finally happening. 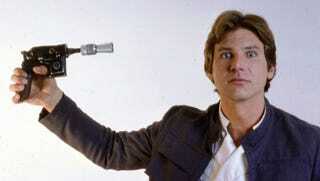 We’re getting a movie abut the origin of Han Solo. The good news is that putting The Lego Movie’s Lord and Miller in charge is definitely a good call; the bad news is there’s a ton of potential to needlessly ruin one of our favorite characters ever. Where do you fall on the scale? For instance, I can far too easily see a film where a very young Han Solo engages in pod-racing in a misguided attempt to reclaim a but of the prequels. We already know that, thanks to the in-canon Marvel comics, Han Solo actually has a wife, which would be totally weird to see on-screen. And II’ve also literally had a nightmare once about Asthon Kutcher playing young Han. But hope springs eternal, and Lord and Miller have a pretty outstanding track record. So what could go right? Could we get a movie about Han going AWOL from the Imperial Academy? Could the game where Han won the Millennium Falcon off of Lando possibly meet our expectations? Isn’t a movie of Han Solo running around the galaxy, being a scoundrel a fundamentally good idea? It could go either way. So tell us what you hope will happen, what you fear might happen, and what you think will probably happen. And may the Force be with us.